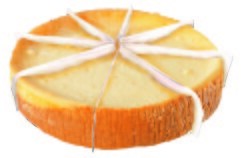 Famous New York-style cheesecake – smooth and creamy. This traditional dessert is a delight any time! This rich, creamy cheesecake has a tasty cookie crust and is finished with a sprinkling of dark chocolate cookie crumbs. A melt-in-your-mouth favorite! A strawberry lover’s dream! A delicious mixture of strawberry puree blended into a two pound, classic cheesecake. Thirty-two oz. only. Pre-sliced for easy serving. While peanuts or other tree nuts may not be a key ingredient in our cheesecakes, all of the items listed here are made in a facility where products containing various nut items are created. Though best practices are used in the manufacturing of our cheesecakes, inadvertent cross-contamination may occur, and we cannot guarantee that a product has not come in contact with nuts or nut oils. Cheese Filling: Cream Cheese (Cultured pasteurized Milk and Cream, Salt, Guar Locust and Carrageenan Gums, Enzymes. ), Sugar, Whole Eggs, Milk Solids, Natural and Artificial Vanilla Flavor. Plain Dough Crust: Flour (Wheat), Sugar, Palm Oil, Graham Flour (Wheat), Corn Syrup, Modified Tapioca Starch, Vegetable Shortening (Soybean),Baking Soda, Salt, Honey, Natural Flavor. 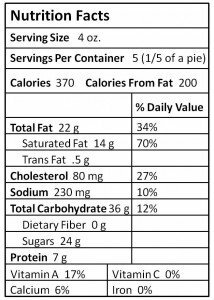 Chocolate Dough Crust: Flour (Wheat), Sugar, Palm Oil, High Fructose Corn Syrup, Cocoa (Processed with Alkali), Yellow Corn Flour, Modified Tapioca Starch, Vegetable Shortening (Soybean), Dextrose, Baking Soda, Salt, Natural and Artificial Flavor, Lecithin. Plain: Cheesecake Filling, Plain Crust. Cookies and Cream: Cheese Filling, Chocolate Dough Crust.